Today we are visiting Rael, the first volunteer teacher in the DayCare. She lives with her husband and their five sons. They are farmers and grow maize. But what they grow is only enough for self-sustaining. Next you will see the interview in which she told us about her life in Kiburanga and her impression about EduKA. – What differences can you see since you took part in Kiburanga Women Self Help Group? It has cause a great impact. For example, we now have a latrine which was built by a group of volunteers. Also, my daughter got a grant to buy the uniform and pay the school fees. – How do you think this community can improve? 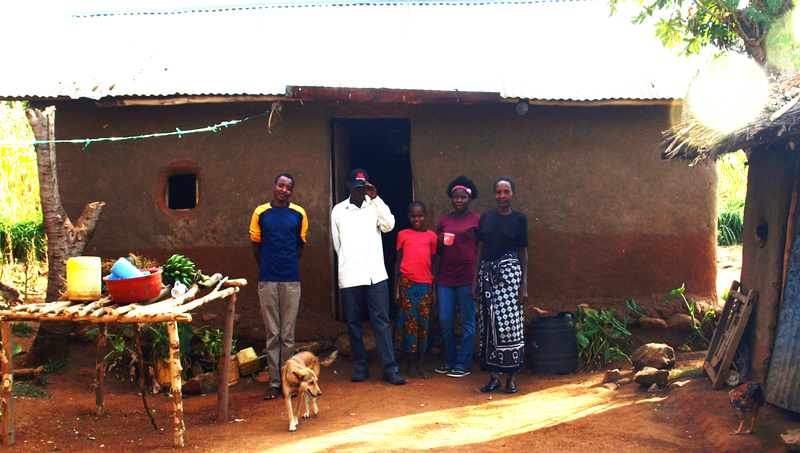 – Being independent is really important to us, we need to get enough incomes to support the family and having more pieces of land would also be helpful. – Do you know what EduKA is? – Yes, EduKA was created by two volunteers and its aim is to help children in terms of education. – Are your children registered in the EduKA project? – Only Faith, our youngest daughter. – How is EduKA helping you? – EduKA help us pay Faith’s school fees and provided us with a uniform for her. We are afraid of Faith having to drop off school as her brothers did. – What do you think you might need to improve your living conditions? – Apart from our children education, having a dairy cow would help us feed the family better and we could sell the surplus to get some extra incomes. – Finally, what would you say to the people collaborating with the project? – I would tell them they have a huge heart. Without even knowing one another, they are helping our community and thanks to them, Faith can go to school because now she has a pair of shoes and a uniform.